How to access your Motorola Surfboard modem and understand signal levels. The Motorola Surfboard Cable Modems have been a mainstay for Internet connections and perform very well. These popular modems have several later modems and the SB5100 Docsis 2 modem is indicative of what you may find in any of the Surfboard line. Their interior pages can give you a snapshot of information about your Internet provider's Internet signal strength and potential problems that could affect your connection and ultimately your VoIP service. To access your surfboard cable modem open your web browser and use the IP address of 192.168.100.1. The default page that will open is the Status page. 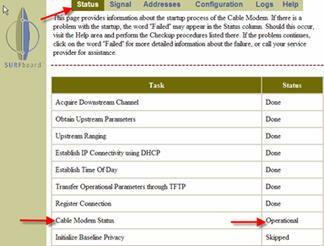 The information on this page gives a snapshot of a series of events that the modem goes through when establishing a connection to your cable ISP. The important item that indicates if the cable modem is online is Cable Modem Status, which should indicate Operational (Operational could be displayed in more than one line, where the illustration below shows Done.) This can be determined by the Online light being solid. The next page in the Surfboard cable modem to check and the most important in determining how good the connection is to your cable provider, is the Signal page. Other pages in the Surfboard's internal pages give additional information including a limited sized log file. Reading Logs on the cable modem can give troubleshooting information, but this information is quite advanced and in most cases would only be a benefit to the provider's technical staff. 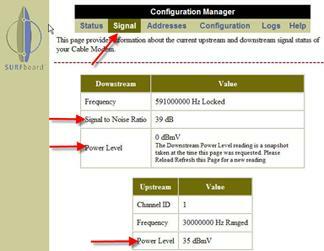 Downstream Power Level- This level is the downstream signal strength and can be plus or minus. Typically the lower you go in the minus range the more the modem struggles to keep being acquired. Getting down below -8 to -10 can result in periodic dB changes where the signal could degenerate even more to possibly -11, -14 or worse and loss of sync. Signal to Noise Ratio- This reading should be above 25/27, but in the 30s would indicate a nice clean signal. Upstream Power Level- This reading should certainly be lower than 54, depending on specifics about your cable companies equipment, as an absolute maximum, but would be better to be in no higher than the high 40s. Also known as the transmit level or return signal, as it gets into the higher regions the cable modem will have a harder and harder time keeping connectivity. Remember, that when checking the cable modem signal levels to remember that these readings are a snapshot at that time. If you have issues on rainy days then compare the readings on a clear day to one when it rains. A deterioration of signal strength would indicate a moisture problem in either a splitter, cable or connection degrading your signal. Normally temperature changes can affect the power levels by plus or minus 3dB; a reason why you would not want signal levels close to the extreme limits. VoIP requires a good steady connection to your cable ISP provider. Your cable modem can give you information about how good that signal is and hence, the stability of the connection. This power level shows the amount of signal received by the modem from the cable companies' transmitter. -15 dB to +15 dB maximum. -12 dB to +12 dB or better recommended. 0 dB is the optimal level. Upstream (Tx) Power Level: This power level is the amount of signal transmitted by the modem back to the cable componies' receiver. +8 dB to +54 dB maximum. Recommended upstream signal levels are +35 dB to +52 dB. A cable modem running a higher upstream modulation rate could possibly in some cases lower the modulation rate if the Tx level is higher than the maximum signal level allowed. This condition could cause slower speeds, packet loss, and even loss of connectivity.